I, admittedly, am usually far too lazy to make my own puff pastry, and so this was the first time I'd made it from scratch. If you've never had home made puff pastry before, let me tell you: you are missing out. This was the most incredible pastry I have ever had in my entire life. I am in love. It was a struggle to not eat it all on the spot. It will be a struggle to eat the packet stuff ever again. The process is time consuming in that there are multiple steps to letting the pastry rest, but the process itself is very simple. First you make the dough and the beurrage, or butter block. … then fold it into a neat little package. You then roll them out into a long, thin rectangle. Fold it into thirds and repeat. And repeat. And repeat. What results is the most lovely, golden, flaky pastry you will ever consume. This version is so buttery and delicious. It almost tastes like shortbread. We sat there eating the offcuts, musing about how amazing it tasted, trying to wait until assembly before consuiming the rest. 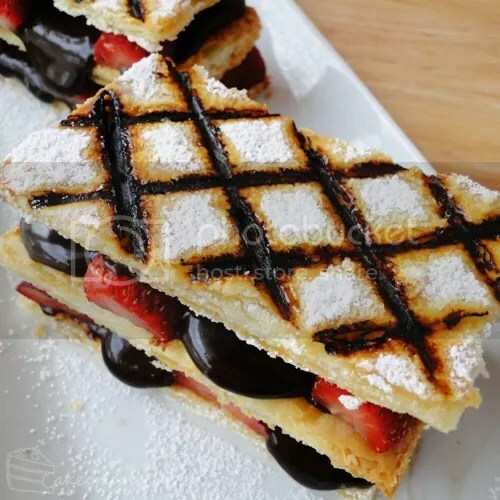 I cut the pastry into rectangles, then assembed with strawberries and chocolate custard. I dusted the tops with icing sugar and used this skewer technique to make a caramelised lattice. You can fill it however you want. I did a few with stawberries, and filled the rest with just chocolate custard. Let your favourite filling be your guide. Blend custard powder, cornflour, sugar cocoa and vanilla in a pan with a little of the milk to make a smooth paste; stir in remaining milk. Remove from heat; stir in egg, butter and chocolate until smooth and well combined. Transfer to a bowl, cover with plastic wrap and refrigerate until chilled. 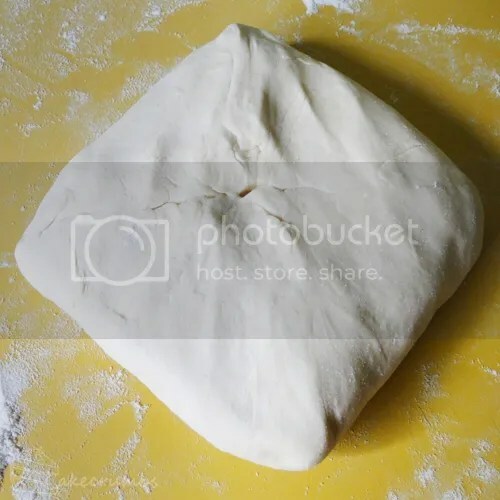 Turn dough onto a lightly floured surface and knead for three minutes, or until smooth and elastic; cover with plastic wrap and refrigerate for half an hour. Meanwhile, combine the room temperature butter and the smaller quantity of flour to create your beurrage. Place between two layers of plastic wrap; using a rolling pin, flatten and shape into a 12cm square. Refrigerate for 10-15 minutes. 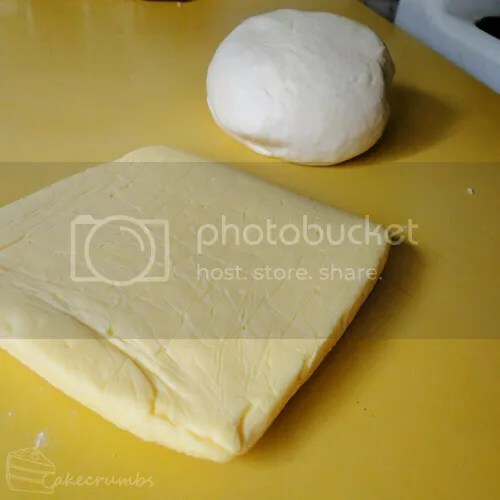 When the dough has chilled, roll it into a 15cm square. 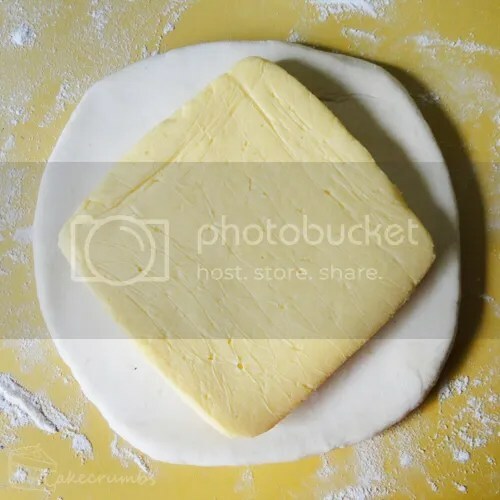 Place the beurrage in the middle so that each corner faces the length of the dough. 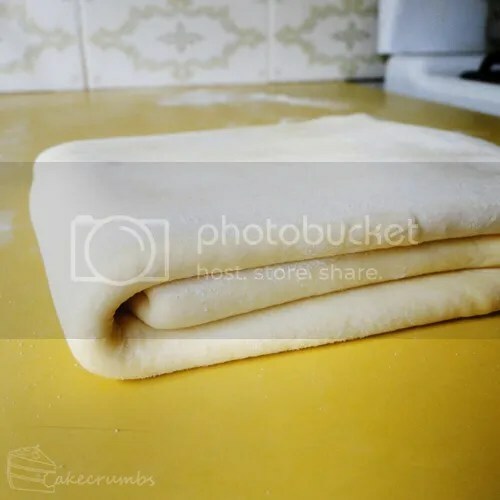 Fold each corner of the dough to create an envelope-shaped parcel. Turn over the parcel and tap it with the length of your rolling pin to flatten. On a floured surface, roll your dough into a large, thin rectangle. Fold the dough over into thirds, then repeat the previous step. Repeat steps 8 and 9, then repeat step 8 a final two times. You may use immediately, or refrigerate until required. To bake the puff pastry, preheat your oven to 200°C. 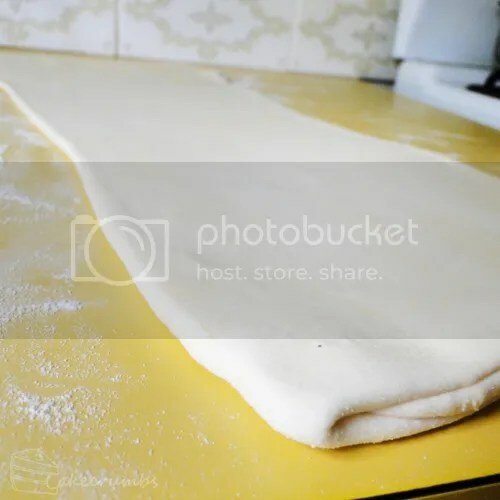 Roll your pastry into a large, thin rectangle. Cut into portions that will fit onto your baking tray. 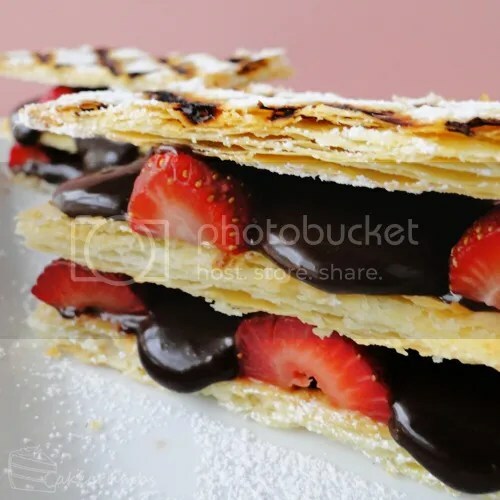 Place pastry onto a greased or lined baking tray; prick pastry all over with a fork, then lay another sheet of baking paper on top of it. Use another baking tray or heavy dish to weigh down the pastry. Bake pastry for 15 minutes, remove the baking tray and baking paper, then bake for a further 10 minutes (or until golden brown). Allow to cool. Cut your pastry into desired-sized pieces. You may use three large pieces and cut into individual portions later, or you may want to cut individual-sized portions from the beginning. Place your first layer of pastry on a serving dish, dollop with fresh fruit and custard, then top with another layer of pastry. Repeat. How on earth did you manage to produce such a beautiful mille feuille after two all nighters?? That is so impressive. 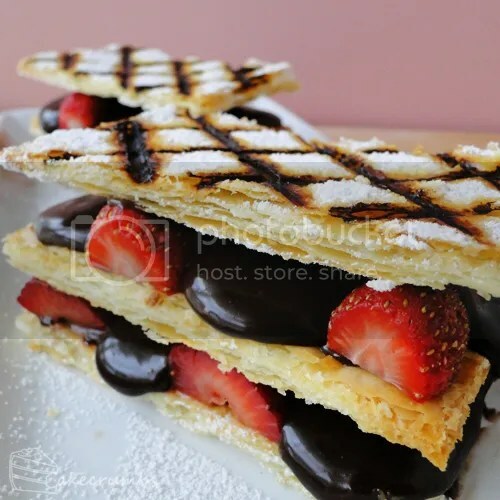 I love the glossy, rich chocolate custard & strawberries, that perfect pastry and the really striking effect of the caramelised lattice. Simply gorgeous. Congratulations on finishing your thesis/Masters! Thanks so much! ♥ The thought of getting to consume puff pastry at the end was motivation enough! 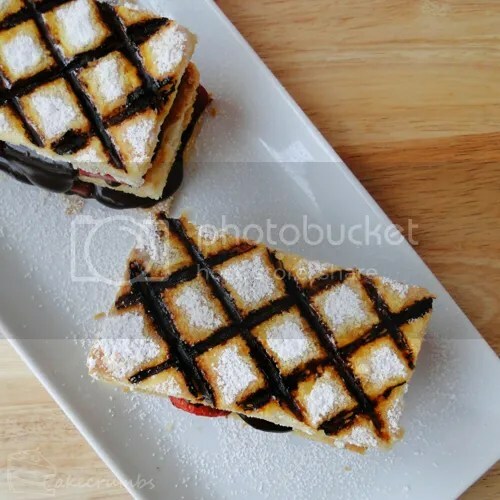 The skewer technique on the top makes it look so professional – it looks really decadent and delicious – yum! Thanks so much! It is indeed wonderful – I don’t know how I have managed to go my whole life without it.